The Jintu remote shutter release is a handy little gadget for triggering your DSLR camera without having to physically touch the camera. It’s a wired unit that’ll work with a range of brands (tested on a Canon 80D) but it does require the camera to have an aux control input. The unit itself requires 2 x AAA batteries to operate and it has a simple LED screen at the top to control the settings. The Jintu has two main functions, it can be used to trigger the camera for a single shot or for multiple shots and it can be set to take multiple shots, handy if you want to experiment with time-lapse photography (something the 80D can do natively). The remote gives you control over a number of options: you control how long before photos are taken, the exposure time and how many photos should be taken. If taking a high number of photos the remote can be a little clumsy to use and it can take a while to set it to high photo counts. As the remote button operates the same as the main camera trigger it meant that it couldn’t be used on the Canon 80D to trigger video recording (which requires you press the ‘Start/Stop’ button instead). Once you start the unit you can then stand back and let it do it’s thing. The wire is just long enough to rest this on the ground while the camera was tripod mounted, alternatively you might find it useful to tape it to your tripod for easy access. Not touching the camera to trigger a photo is handy if you’re looking to take long exposure shots and you want to avoid the camera moving when you press the shutter button. Unlike the Canon 80Ds native timelapse mode, which produces a timelapse movie, you’ll need to create your own movie from all the photos the camera will take. This doesn’t take long to do and it opens up new photography options if your camera lacks a built in time lapse function. ★ Note : This is a manual lens, NO Electronic Contacts, your camera will not detect the lens when mounted, that's why it shows not connecting properly, please switch to MF MODE in order to use this lens correctly. Tips to use our Manual Lens: 1) Set the mode dial to Manual (M). 2) Set the Release w/o Lens option in the camera menu to Enable. 3) Set the Shutter lock option in the camera menu to Off: no lens. 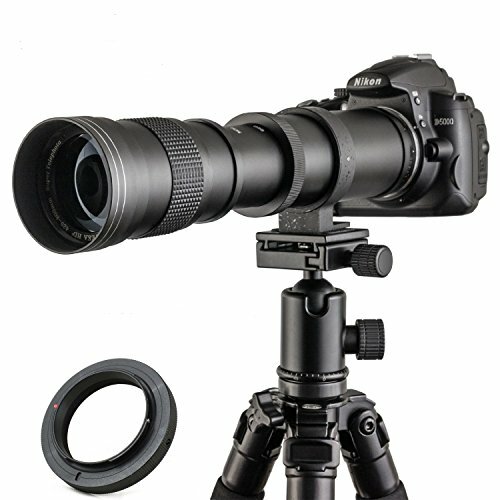 ★ Perfect for the professional and amateur photographer . There is a built-in, rotating tripod mount for easily attaching to your tripod or monopod. better use with tripod together. lower price but got a high value lens. ★ Great for the wildlife or nature photographer who wants to be hidden while taking photos of the subject. JINTU brand supply 2 years warranty ,JINTU Appearance patent with JINTU packing box. no other reseller.